Boom baby! 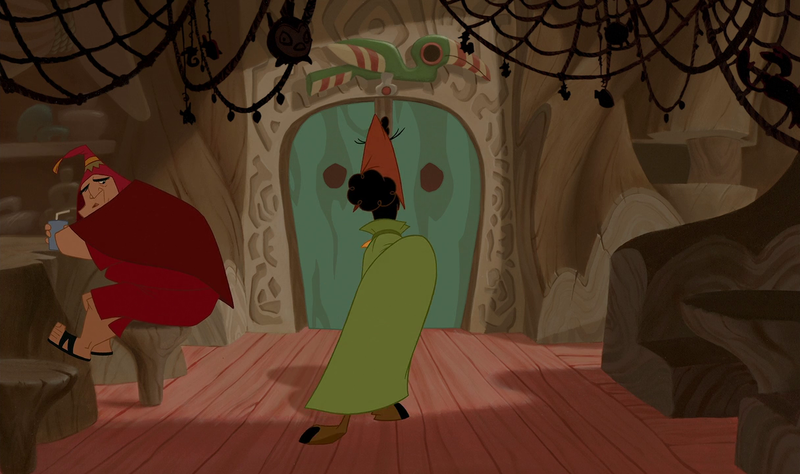 I know you couldn’t handle just having just one week of Emperor’s New Groove, so here’s another! 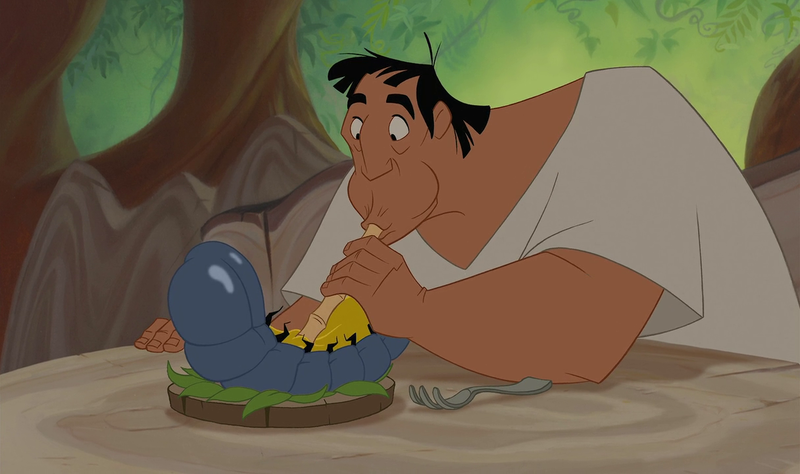 We made some amazing food for the second half of Emperor’s New Groove, including the giant pillbug that Kusco and Pacha ate (not really, but we have a good recipe inspired by that). .
Also, I wanted to do a shout out to Dreams To Become. They run a fun blog where they watch and comment on all the Disney movies (among other stuff). They came and helped us eat all the Emperor’s New Groove food last week! Check out their blog, you won’t be disappointed. So when Kusco and Pacha are in the restaurant, you see an old guy drinking some kind of drink. There is a Peruvian beer called Chicha, and Pacha’s wife also happens to be named Chicha. 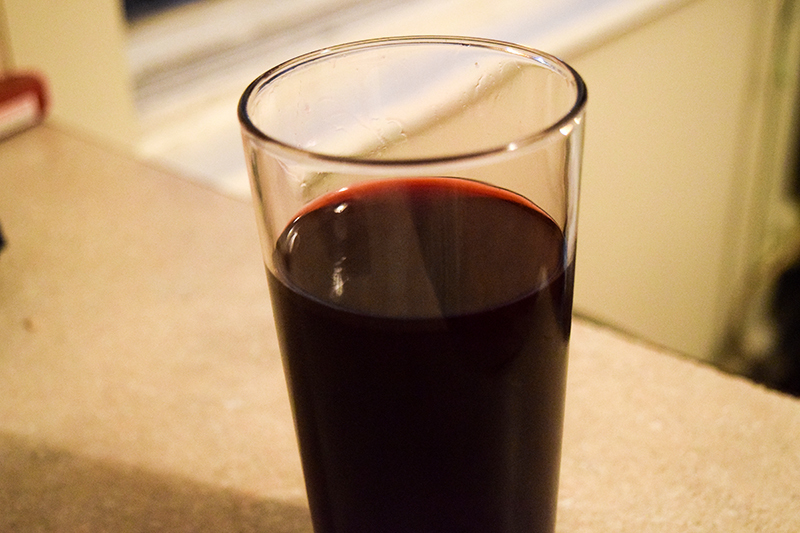 So I found a recipe for non-alcoholic Chicha. It’s kinda like a Christmas-Spiced Koolaid. I enjoyed it. 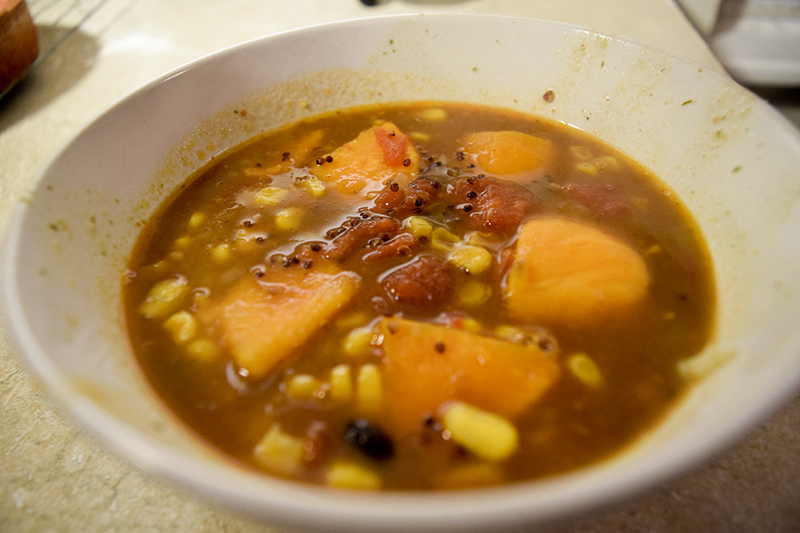 In a large pot, bring the corn, water, cinnamon sticks, cloves and half of the pineapple peels to a boil. 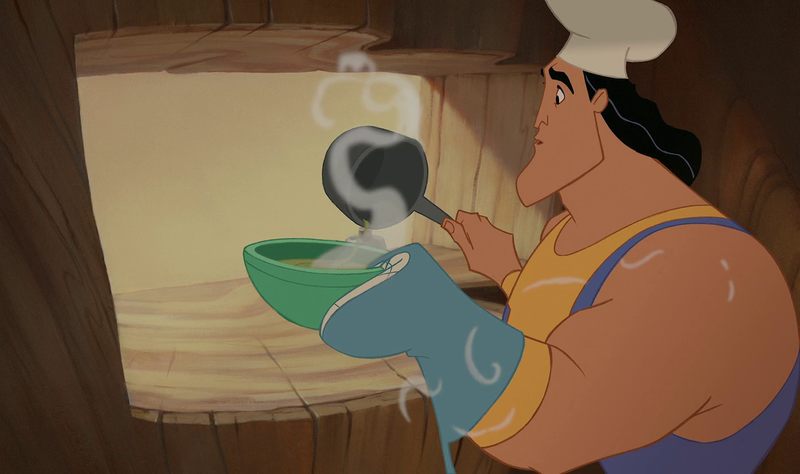 This is another well-known food from Emperor’s New Groove. The huge pillbug they ate in the diner. I’ve eaten enough bugs…and didn’t want to go through the huge effort of going down to South America to find a giant pillbug. So I made a mock pillbug out of bread and potatoes. It turned out really really well! In a large bowl, dissolve yeast in warm water. Let stand until foamy, about 10 minutes. Add the salt, oil, blue food coloring and 1.5 cups of flour to the yeast mixture. Mix with stand mixer until the dough has been mixed. Knead until elastic for about 5-6 minutes. Oil a large bowl, place the dough ball in the bowl, cover and let rise in a warm place. Let rise for 40 minutes, until it is doubled in volume. Separate into 2 larger balls and 2 slightly smaller balls. Place the 2 largest balls together in the middle and the 2 smaller balls on the outside. Press so they join slightly. Place on a baking sheet that is oiled and sprinkled with corn meal. In a small bowl, beat together an egg white and the water, add 2 drops blue food coloring. Cut off the flat bottom and scoop out the inside bread. In a blender, mix the blended peppers, oil, milk crackers, queso fresco, and salt. 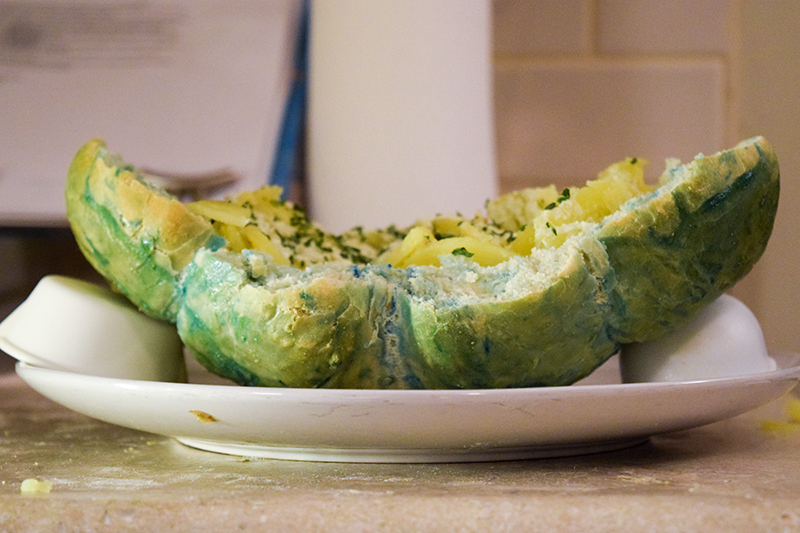 Place the potatoes inside the bread bowl and pour sauce on top. When the chef at the diner quits and Kronk takes over, the chef dumps a red stew into his briefcase. I found an authentic Inca stew that happens to be red. Add the Quinoa and stock. 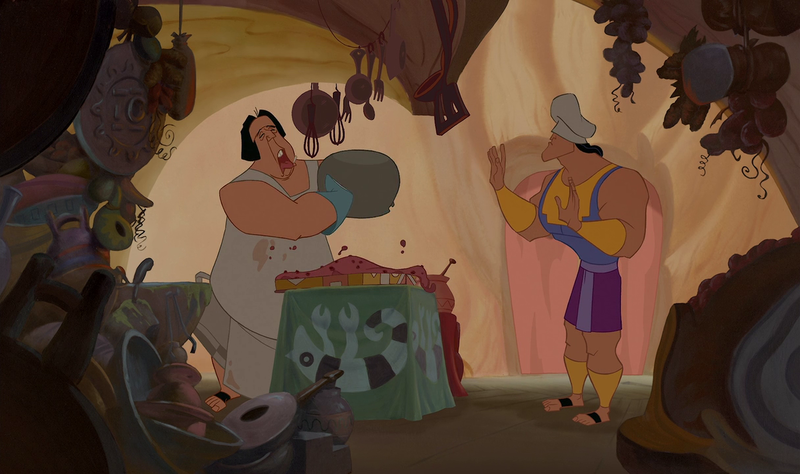 Kronk gets a big order when he becomes chef.But strangely, the stuff that actually gets shown isn’t anything that was actually ordered. One of the orders was a green soup. 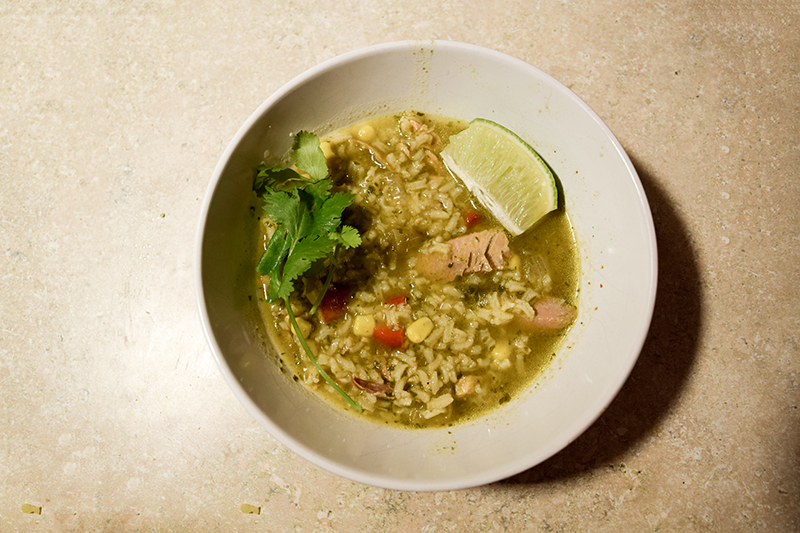 We made a great Peruvian soup. 2. In a large pot, heat olive oil over medium-high heat. When hot, carefully add chicken. Cook until cooked and slightly browned. Remove from pot and set aside. 6. Add a few cilantro leaves to each bowl of soup, along with a few wedges of lime. 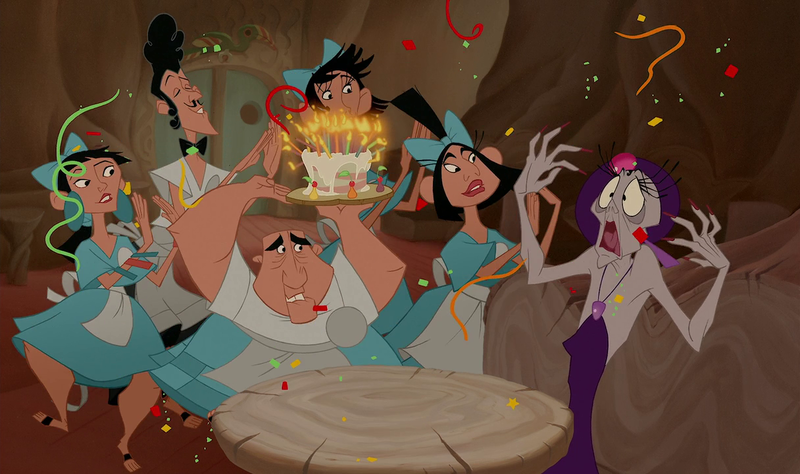 I love this bit with Yzma getting a surprise birthday song. 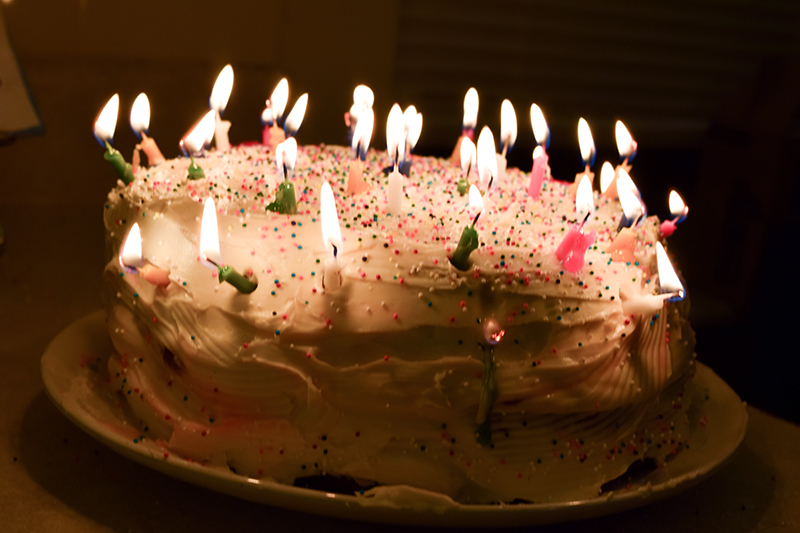 They bring out a pink cake with white frosting with like a billion candles. We made a very yummy strawberry cake. In a large bowl, beat together the butter, sugar and dry strawberry gelatin until light and fluffy. Beat in eggs one at a time. Blend in vanilla and 1/2 cup strawberry pie filling. We’re done with the diner! 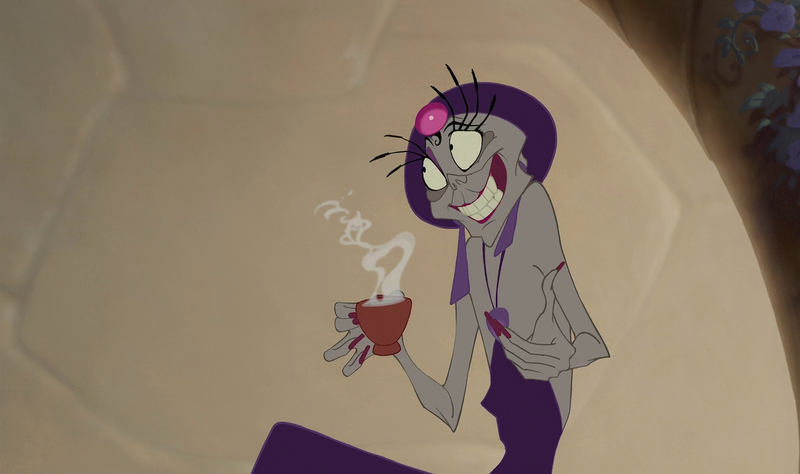 When Yzma is at Pacha’s house, she is drinking tea or coffee probably. But we found a recipe for an Inca chocolate drink. In a mixing bowl, mix the masa harina and 1/2 cup water. Mix to form a paste. In a saucepan, add the paste and 3 cups of water. In another sauce pan, bring milk to an almost boil. 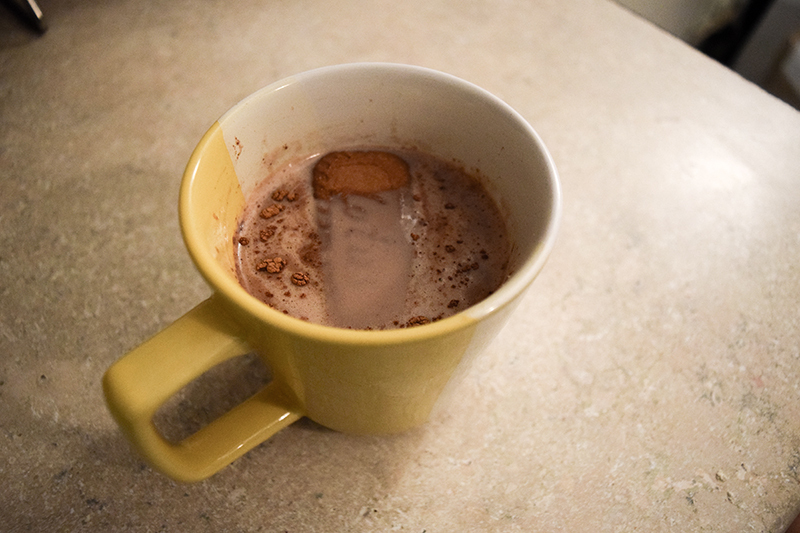 Cook for 10 minutes until it is completely dissolved. Will it Make you Say Booo-yah? All the food was delicious. The pillbug was especially good, probably because it was not actually a pillbug. I just finished watching TENG. I hadn’t seen it since it first came out. I’d forgotten how hilarious it was. I’d forgotten about the pill bugs and after the movie I did some research to see if they are edible and they are. They’re a crustacean related to lobster. So I would add some lobster to your already over the top potato pill bug.